Home » Lifestyle » Join Me For a NYC Food Photography Class! Join Me For a NYC Food Photography Class! Ok, I have something fun to share with all of you outside of the normal realm of recipes on here! 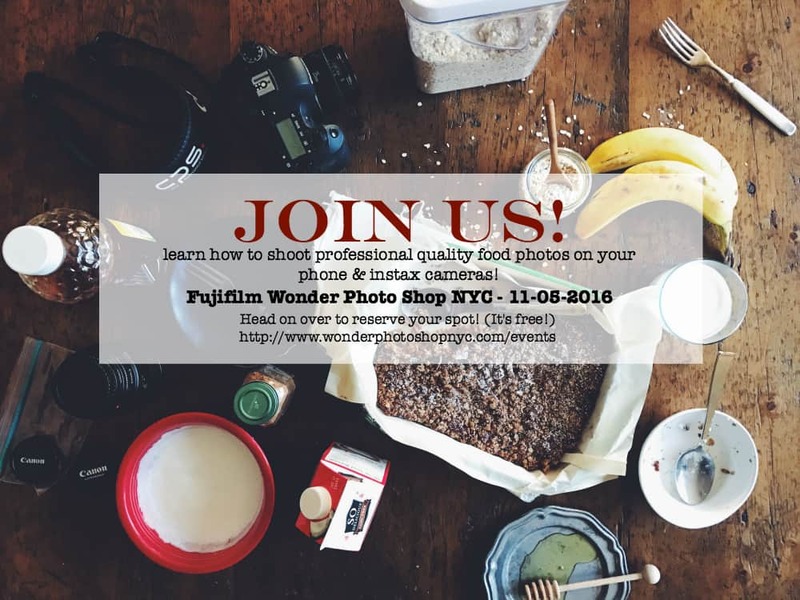 If you’re local to NYC, myself along with Brandy from Nutmeg Nanny will be teaching a FREE food photography class at the Fujifilm Wonder Photo Shop next Saturday, November 5th! The workshop is an hour long and we’ll go over how you can take professional style food photography with your cell phone or the super fun Fujifilm Instax camera (have you seen them yet? they’re a super fun throwback!). The class is FREE and all food (for photography purposes…ok, and snacking too) will be provided along with the use of Instax cameras. We’ll cover basics like how to make your shots brighter, fun editing tools/apps and how to style your photos to make them look authentic. Don’t worry if you’ve never thought about shooting food photography before, it will be a fun setting with snacks (always a plus!) where you get to hang out with Brandy and I. If you’re interested, you can Register for the event by going to the Fujifilm Wonder Photo Shop events page and clicking on our event. OR, I’ll do the hard work for you and you can just click THIS LINK to RSVP!